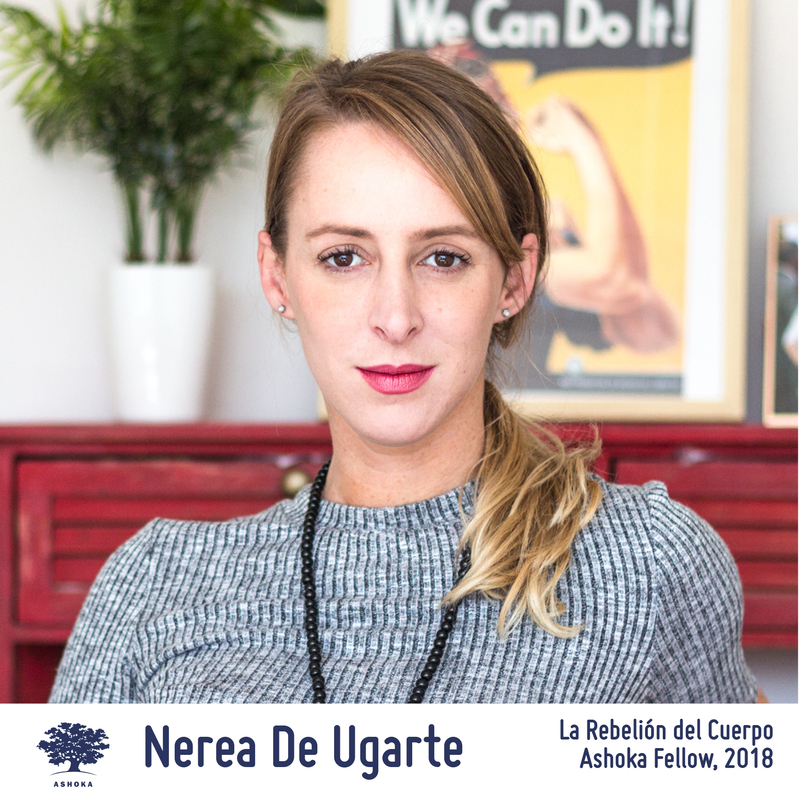 This description of Nerea De Ugarte's work was prepared when Nerea De Ugarte was elected to the Ashoka Fellowship in 2018. Nerea is fighting mental health complications that persist from outdated gender norms and stereotypes by changing the culture that creates them instead of simply addressing the symptoms that appear in individual people. She is challenging these pressures on various fronts: educating girls from a young age, influencing public policy, and demanding higher standards for advertisements portraying women. In her work as a psychologist and sexologist, Nerea saw the effect of societal pressures ands stereotypes on women’s daily lives, confidence, and self-esteem. Beauty standards still hold women to an impossible standard of slenderness and sexiness that caters to a male gaze. Nerea is working against this cultural narrative to change the environment in which girls grow up so that they can develop healthy relationships with themselves and their bodies. Through both of her organizations, La Rebelión del Cuerpo (The Body Rebellion) and La Fundación Niñas Valientes (The Brave Girls Foundation), Nerea works on four levels: 1) through the use of social media campaigns, 2) through workshops with students and teachers, 3) through working with lawmakers to develop legislation about the portrayal of women in the media, and 4) through working with sociologists to collect hard data about the issues affecting mental health in Chile. Children’s health, and in particular, girls’ health, suffers from these cultural narratives that Nerea combats, so she approaches these issues as health issues. Despite the gendered nature of the issues she’s addressing, she focuses on health because she believes that they should be seen as essential to address and not divisive by focusing on the gender aspect. Nerea has chapters of Rebelión del Cuerpo in 10 different regions of Chile, in addition to chapters in Spain, Australia, Mexico, and Argentina. Over 1,500 volunteers are organizers and leaders of the Rebelión, and over 50,000 people follow their Instagram page, which is their main method for public organizing for their social media campaigns. She has already led movements to take down 5 national advertisements that portray women as stereotypes, and has partnered with congressional candidates in all political parties in Chile to support legislation that requires a notice when an image or advertisement has been altered by image altering software. Chile, like many countries around the world, has a culture of machismo that pressures women to look and behave in certain ways. According to the Centro de Estudios Públicos (Center of Public Studies), 69% of Chileans agree that “Having a job is fine, but what most women really want is a house and children.” This social belief is also reflected in the laws of Chile. The Servicio Nacional de la Mujer y la Equidad de Género (National Women and Gender Equity Service) was established in 1991, and only then were laws passed that eliminated legal distinctions between men and women. The difficulty of passing laws that support gender rights and equality continue to enable the message, especially to young girls, that they are not equal. According to the Harvard Review, women in industry jobs earn 71.3% of what men do, and women in mining, one of Chile’s biggest industries, earn 60% of what men do. This pay gap implies that women are literally worth less than their male counterparts. Additionally, advertisements and media continue to portray women with certain body types that establish a definition of beauty and set unrealistic standards for regular people. These gender gaps and cultural narratives take a toll on women’s mental health, which leads to issues like low self-esteem and lack of confidence. It also creates larger problems, like an environment that accepts bullying, depression, and eating disorders as a norm. According to a study done by Rebelión del Cuerpo, young female adults in Chile, aged 14 to 25, spend an average of 3 hours a day thinking about their body image. Around 40% of this demographic report fears of gaining weight on a regular basis. A shocking 58% of them report that their main worry in life is their physical appearance, chosen from a list that included options relating to their relationships with family and friends, intellectual growth, and personal achievements. According to a self-esteem survey conducted by Unilever, 1 in 2 girls say they feel pressure to conform to a particular body type. Almost 40% of girls aged 10 to 17 have sat out from an activity (ranging from participating in sports to attending school to raising their hand in class) because of self esteem. These problems affect girls and women in a disproportionately larger range than boys and men. The US National Institute of Health states that Chilean female adolescents are an at-risk group for eating disorders. Almost 4% of Chilean female adolescents have been officially diagnosed with an eating disorder, with even more reporting dissatisfaction with their body. Around the world, depression is 1.7 times more common in women than in men, and more than twice as common in girls than boys ages 14-25 years. Nerea found that women grow up lacking the emotional, cognitive, and social tools to confront a culture that imposes strict rules on how they must look, feel, and what they must aspire to be. Symptoms of this problem include bullying, depression, anorexia, bulimia, and anxiety, which are problems that affect women for the rest of their lives. Like alcoholism, bulimia and anorexia are chronic and have no permanent cures, but stay with a person forever; they can only manage these diseases, but they can never fully eradicate these dangerous and life-threatening illnesses. Nerea is changing the way society views women and girls by breaking stereotypes that traditionally define and confine women to domestic roles and hold them to unrealistic beauty standards. To do so, she is changing the environmental context that creates gendered stereotypes and beauty standards so that children are no longer taught these cultural narratives. She works with the advertising and media of companies who continue to create content based on those stereotypes, with lawmakers to ensure the regulation of that content, and with schools to teach young people different values and emotional tools to deal with the onslaught of expectations seen in culture and media. La Rebelión del Cuerpo consists of a central group of 6, including Nerea, in Santiago. They run the Rebelión del Cuerpo social media and oversee local chapters of the organization. At the local level, all participation in Rebelión del Cuerpo is volunteer, and anyone can apply to be a coordinator and start their own chapter. La Rebelión del Cuerpo has over 50 thousand Instagram followers, and over 1,500 volunteers throughout Chile and around the world. There are currently chapters in 10 different regions of Chile in addition to chapters in Argentina, Spain, Mexico, and Australia. The local chapters can propose their own initiatives and projects, and the executives in Santiago choose whether or not they want to sponsor the local projects. The central chapter also commissions projects for communication, education, research, and volunteering. Through organized, community-based solutions, Nerea is able to lead a movement but still allow the rebellion to belong to everyone. Content creation underlies all of Nerea’s work. In addition to working on the national scale, Nerea conducts projects with women in local communities, like setting up exhibits where women can display their own stories in their communities. Every week, they publish online women’s testimonies in addition to regular reflections about sexuality, self-esteem, and gender. Nerea’s reputation has brought her several invitations to write opinion articles and co-author books on issues of gender, media, and education for young girls. Nerea strives to make her movement an inclusive one for all women, and not just those who identify as feminists or share certain political beliefs. Nerea believes that the face of the rebellion are the faces of all the people who participate and share their stories with the world. Whenever one of the local chapters finds an advertisement that they feel is irresponsibly displaying stereotypes about women’s bodies or gender roles, they will send them to the supervising group in Santiago, who decides whether or not to publish the advertiser’s information on their social media and assemble their followers to publicly pressure the advertiser to take down their advertisement, particularly through Instagram, the Rebelión’s main social media. When they do publicly highlight an advertisement, the company will often contact the Rebelión del Cuerpo to request that they stop posting negative comments on their ads. But Nerea’s response is always that they will only stop if their company issues a public apology. In this manner, Rebelión del Cuerpo has been able to engender public apologies from Steve Madden, Popeyes, Canada Dry, Watt’s, and Claro Chile, with an ending result of the companies foregoing continued advertising with the insensitive content. In her work with government authorities, Nerea is championing legislation about what advertisers are allowed to show in their publicity. In doing so, Nerea is working to eradicate harmful images that portray an impossible ideal of the female figure by requiring a mandatory warning of the advertisements when images are altered or Photoshopped. In 2018, Nerea had 12 different congressional candidates — representing all Chilean political parties — sign a pledge to ratify this legislation if they were elected. Important in this push for legislative reform is Nerea’s insight that her initiatives are actually part of a public mental health agenda — instead of gender or education — as these images intentionally or unintentionally promote eating disorders and engender a health issue and should be treated as such. Given the nature of the Rebelión del Cuerpo, Nerea saw the importance of keeping the organization free from ties to companies or governments to maintain itself as a public democratic space. That is in part why she founded Fundación Niñas Valientes, to work more directly with schools and companies to institute change. The Fundación conducts intervention programs for companies to train them about responsible social communication with a gender focus, and to teach them about their impact in society through the media. The Fundación also researches and gathers statistics related to how self esteem affects women’s sexual lives, which are statistics that have not been researched to the level that the Fundación is doing. These statistics give both the Fundación and the Rebelión a better picture of the issues they are facing and how they are changing as Nerea continues her work. The Fundación also conducts workshops in schools for students of all genders, aged 10 to 17, to teach and discuss self-esteem and empowerment issues with a gender lens. These workshops give children emotional and cognitive tools to work against mental health issues like eating disorders, depression, and anxiety, and teach students to combat bullying. Between the Rebelión del Cuerpo and Fundación Niñas Valientes, the children that Nerea is working with are able to see that change is happening, and that Nerea’s projects are opening more space in the world for these students. Nerea’s goal for 2018 is to reach 3,500 students throughout Chile with her workshops. She is also working with the Chilean Ministry of Education to make emotional education with a gender perspective a requirement of all educational programs in Chile. Nerea grew up personally affected by the issues that she is combatting today. She suffered from anorexia and bulimia since she was 11, the former influencing her for 2 years and the latter for 6 years more. Because of access to the internet, she found websites that promoted anorexic and bulimic behaviors, offering encouraging phrases and tips on how to hide these behaviors from family and friends. Her middle school would weigh students every day, and separate them according to weight. This situation aggravated Nerea’s already suffering mental health, and the school’s only method of preventing eating disorders was closing the bathrooms during lunchtime. When Nerea was in university, she had a moment when she knew that she wanted to change her own mentality, and although anorexia and bulimia are chronic diseases, she has been in control of them ever since. Nerea knew that she wanted to study psychology, but it was not until her internship in Algarrobo, Chile, that she knew she wanted to work with women. Interning with the Servicio Nacional de la Mujer for 6 months, she worked with over 80 women and saw that implementing what she had learned earning her degree was not enough for her female patients. She could better help her patients if she implemented a practice beyond what she had learned: a practice more focused on empathy and connection, and helping her patients feel as though they were not alone. Nerea spoke to many women who expressed how intensely they hated themselves both mentally and physically, who shared their stories of abuse, and about the agony of not being able to support their children. Additionally, in Algarrobo she lived in a house with a variety of female health professionals that influenced her to approach problems with multidisciplinary eyes. Consequently, she developed a new theory of therapy practice. Her new method was patient-driven and focused on developing a safe space for women to be vulnerable and to feel empathy and solidarity. She began to see patterns in how women talked about themselves in a self-deprecating way, and how many of their problems and symptoms stemmed from low self-esteem. In every case she saw, Nerea observed that women were not given the social and emotional tools to cope with the situations in which they were living. Nerea started to give lectures and appear on television to talk about women’s health, in addition to writing articles for magazines and science journals. Nerea launched programs to lower the number of sessions a patient has to pay while achieving the same psychological results, making her practice more accessible to more people. In 2015, Nerea began working as the consulting psychologist for the Dove Self-Esteem Project to implement the initiative in Chile with UN Women. Through this initiative, she educated teachers to stop talking about body image in a way that would negatively impact children, and especially young girls. During this time, she became pregnant, and had to step back from her consulting practice because it became too much of an emotional burden, but she returned to working with the programs she was working the week after she gave birth. It was just before the birth of her son that Nerea knew she had to start Rebelión del Cuerpo, and Fundación Niñas Valientes not long after. She knew that the programs that she was implementing and the programs like the Dove Self-Esteem Project weren’t enough to address the extent of the institutional social issues whose symptoms these projects were trying to address. When Nerea launched La Rebelión del Cuerpo, she did so by asking through social media what people thought they needed to be to be the perfect woman. Over 2000 people responded, and Nerea took their responses and made a video with a selection of the responses written on her body, and with her reading them aloud. This powerful video went viral, and her movement has been growing ever since.